That change was proposed under the BLP government of Owen Arthur and Mia Mottley – but it was the new DLP David Thompson government that acted and changed the law to allow development at Graeme Hall. That change was actually the Thompson government’s first legislative priority upon assuming power in January, 2008. And if that isn’t proof that BLP = DLP = “The Elites”, I don’t know what is. The thing about the law in Barbados is this: citizens know that the law is nothing more than a tool to be used by the elites when it suits them. 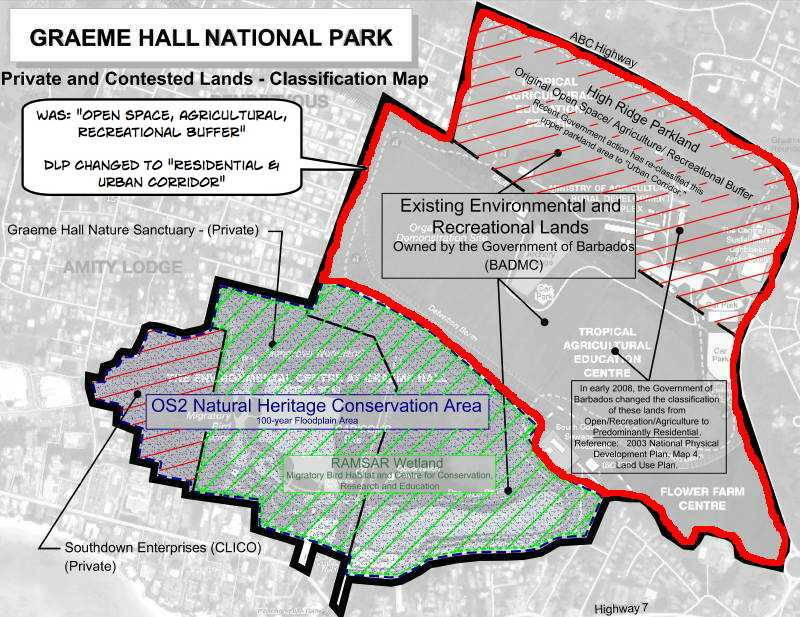 So it wasn’t much of a surprise to Bajans in January 2008 when the newly elected DLP Thompson government changed the law protecting 265 acres of parkland at Graeme Hall to allow developer friends to profit from these public lands. To make this happen, David Thompson and the DLP Members of Parliament had to set aside laws that had protected the land from development since 1988. When the government was finished, 2/3 of the parkland (175 acres) was gone. 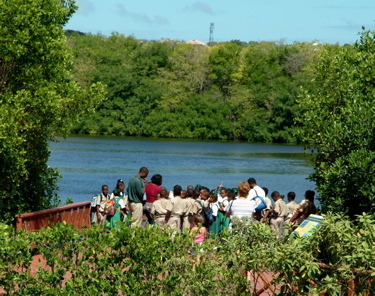 In the natural scheme of things, mangrove wetlands “breathe” with the tides as the salt water mixes with the fresh to provide the environment needed by so many species of plants, wildlife and fish. 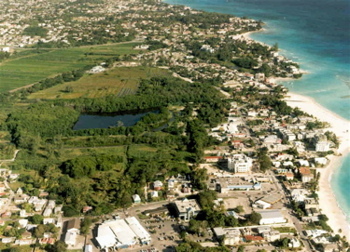 In the case of Graeme Hall, the connection to the salt water of the sea is controlled by the Barbados Government through a sluice gate that regulates the tidal flow to and from the wetlands and ponds. Of course Allard and the staff at the sanctuary initially thought the situation with the ever-broken sluice gate was typical government incompetence. The sanctuary paid for repairs over and over, educated the government officials and lobbied to save the wetlands, but after some time the truth became plain to see. The sabotage and neglect of the sluice gate was deliberate and continues to this day. Marcus and Clive put this article together from various public sources on the internet. If anyone finds any errors, please jump in and leave a comment. We’ve made some serious allegations about how the land permissions corruption works in Barbados and we’re particularly interested what people have to say ’bout that. Come on, Prime Minister Thompson, Opposition Leader Mottley and particularly former PM Owen Arthur. We know you all read BFP. Now what do you have to say to citizens and to international investors about the land permissions allegations in this article? Let’s hear it! after reading your article i have a headache.This is mind boggling.Unbelievable! Heartwrenching! Dispictable ! The trouble with investing in a small island nation like Barbados is that individual investor is often viewed as the proverbial one born every minute. Mr. Allard’s experience if related correctly here is not so unusual in Barbados or elsewhere in the Caribbean or Central America. The amount of his investment and potential loss is not inconsequential but it is not the worst I’ve seen happen. Didn’t I read something that Barbados was looking for philanthropists to partner with the government? Thompson made an announcement a few months ago, you should find it and print it. If the facts are accurate, this is so bad it’s criminal. I can only speak to what I have read here, but if this is true, then BBS look out! This is clearly a harbinger of ill winds rising on the political landscape that end up blowing everyone down the road of Jean Paul Aristide (Papa Doc) in Haiti. It starts slow but a government can’t be a little corrupt for corruption will breed like flies on manure and before you know a new banana republic is born. Real money, the good kind, the honest money, responsible money, and legitimate taxpaying money, will flee and leave. After it leaves the only money that will come in will be via the good-old-boy, pat on the back, nudge nudge, wink wink, network. All that kind of money will ever do is …. what ever it wants. That kind of money is never good for the population at large, only the chosen few and only for the short term, because such arrangements, by their very nature, cannot even be trusted by those involved. These very same chosen few will try to buy off as many of the population as it thinks it needs to in order to fulfill its agenda. The people will be told, it’s good for all of us, It’s PROGRESS and that’s good. We are doing this FOR YOU! What a laugh. But just watch and see if this storey gets any traction and watch as the politicians start to spin a tale. Barbados is the jewel of the entire Caribbean. The British left a good foundation and infrastructure for a healthy safe and prosperous independent BBS to flourish. And because of the people of Barbados it has. So why do Barbadians allow these two-bit politicals to monkey with paradise? Stand up and shout, except do it the modern way and e-mails, petitions, voice mails, blogs, and VOTES, and bring these political sycophants into submission. A safe a free Barbados takes effort, if it is left to the powers at be, and they are not held to accounts then greed and self serving behaviour with ensue. It’s human nature, and just as a parent has to reign in the child when they have done wrong, for not to do so will so will only spoil them, so do the citizens have to reign in their politicians when they are doing wrong. We don’t get to simply elect them and then walk away until next time. We have to hold them to account, we have to let them know they are being watched; we have to make them afraid of us, not us afraid of them. We have the power. As I said at the start, if this story as told is true, it is very troubling indeed. Corruption and real estate development is an ingrained feature of our governance…one of the few topics of unanimous agreement shared by the opposing political parties. why am I not supprised? Been following the Grame Hall Wetland saga for years now, even tried to work with Coastal Zone Management to publish a piece on the convoluted mess we have created for ourselves, and what was the response? Not even a ‘no comment’, just don’t show up for meetings. Wasting de people time for real, and what is it all for? The mighty dollar, so we can all look cool, sitting in traffic in our FORD 250, updating our friends with what we are doing on Twitter on our new Blackberry, while sipping a latte. Get a grip ppl! Get back to reality and your roots! I agree with environmental planner! These big wigs never listen, there is so much corruption in Barbadian government…i wonder how they would feel if we took their Mercedes and BMW’s off them nd put them in the sluice to clean it up! Save Graeme Hall – we don’t need NO MORE condos! Find a new industry to flog!! Barbados gone through the edows long time. i see condominiums being built next to still not sold condominiums. why?can you say money laundering by our own government? or tax write off for billionaires from abroad. that is what it all about. but one day something will happen and Barbados dollar will become like Guyana. you see these politicians are taught good education English standards. but you can take a monkey out of the jungle but you cant take the jungle out of the monkey. you see England gave Barbados independence because too many bajans were going to England and living off welfare so that is why you got independence so you could not go and live there and destroy the place like you destroy your own land. in fact the first people on this Barbados were English and Irish slaves. so the imported Africans are actually not bajan at all but Africans. from Africa.not from Barbados originally. look at what they do to their own people in Africa.